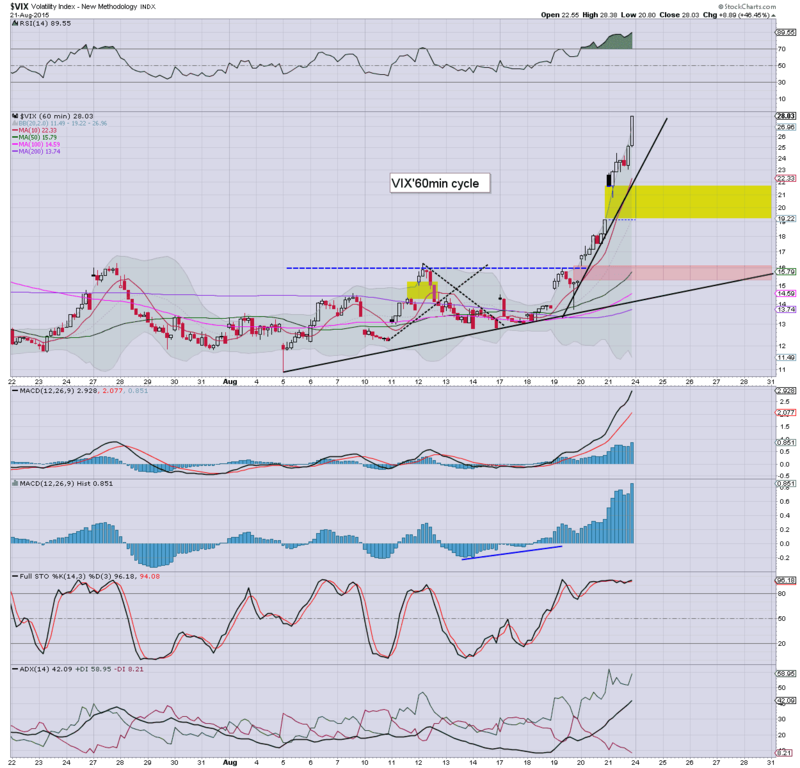 With equities seeing increasingly severe weakness for the second consecutive day, the VIX continued to soar, settling higher by an extreme 46.4% @ 28.03 (intra high 28.38). 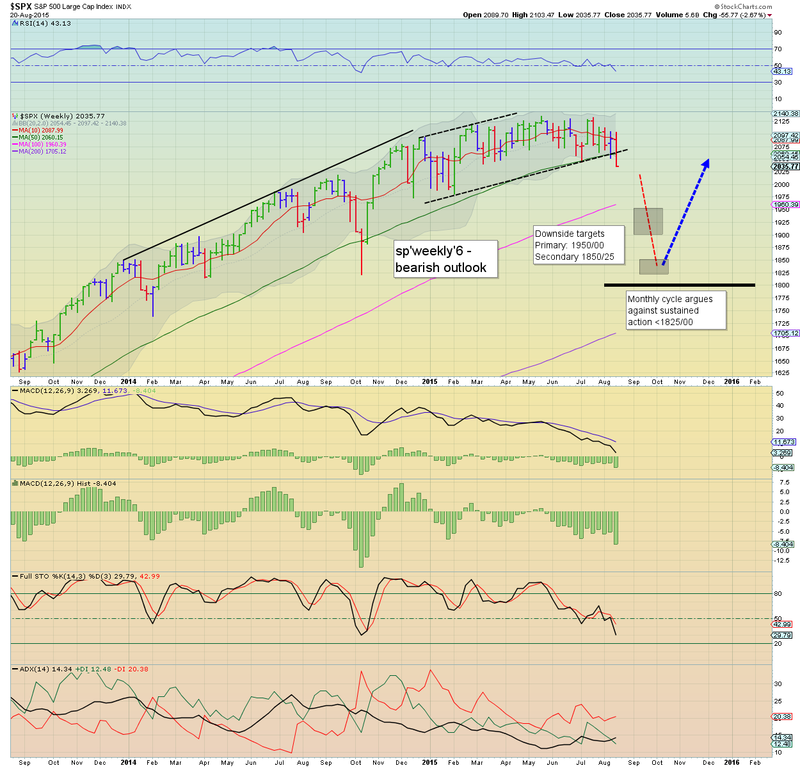 Near term outlook offers an equity bounce to the sp'2040/50s, and that should equate to VIX back in the teens. *an extreme net weekly gain of 118.5%... simply incredible. 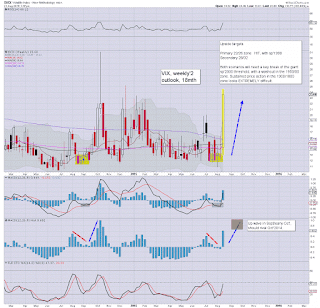 Suffice to say... a VIX that has doubled this week. 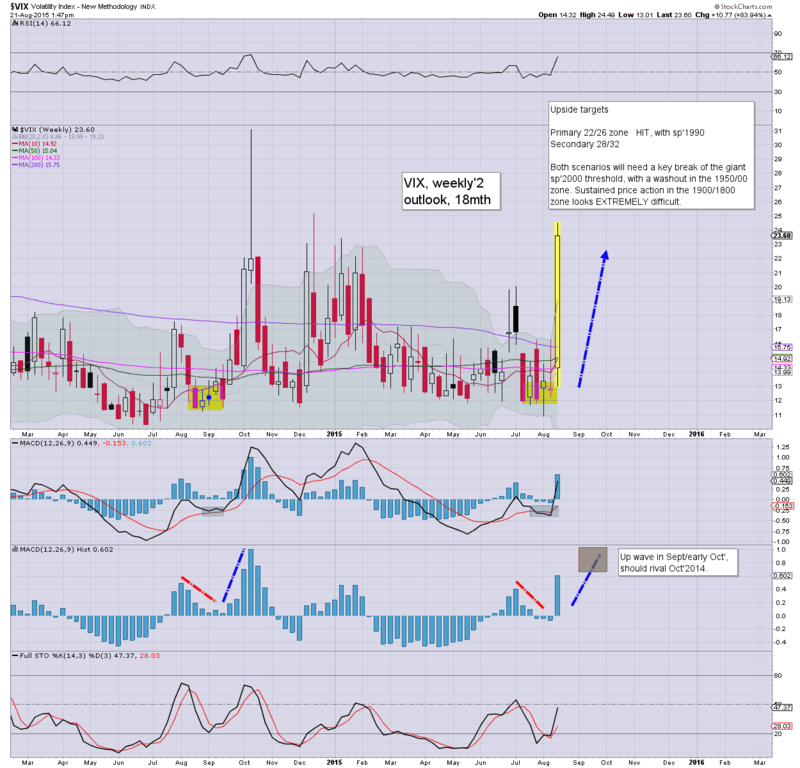 In fact.. the VIX doubled from the Wed' afternoon low of 13.73 - when sp' was spiking to 2096. 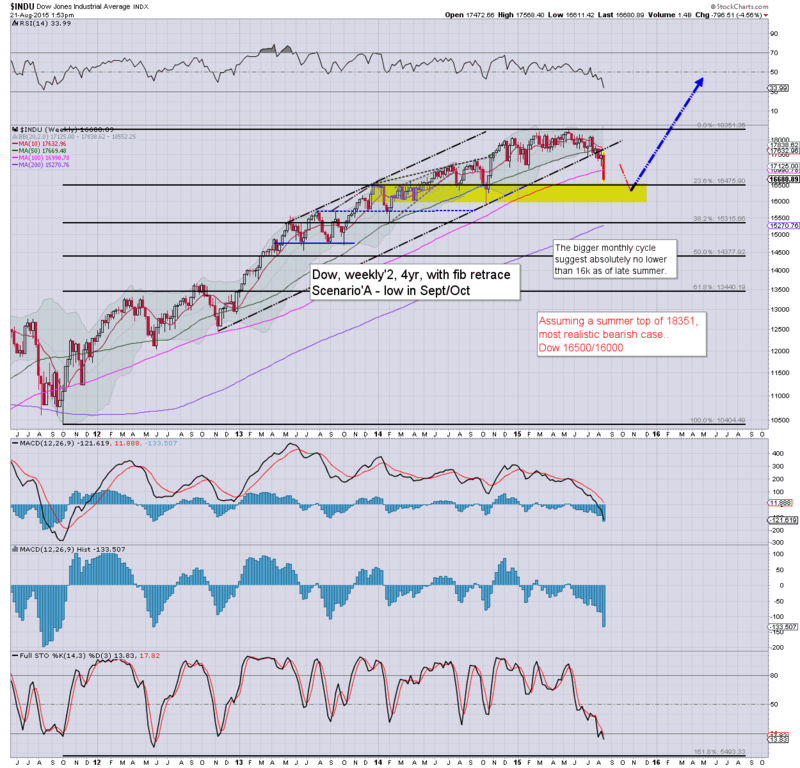 On any equity bounce next week, first target will be the initial gap zone of 22/19. 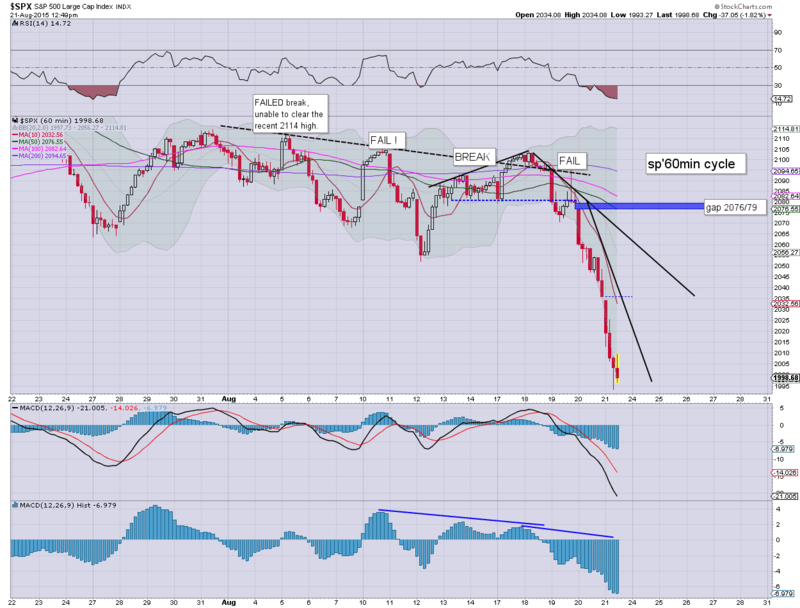 The mid teens look possible if sp' can break to at least the 2040/50s. US equities closed severely lower for the second consecutive day, sp -64pts @ 1970. The two leaders - Trans/R2K, settled lower by -2.7% and -1.3% respectively. 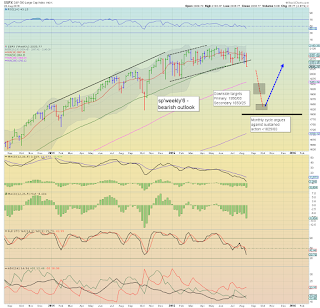 Near term outlook is for a bounce to the 2070/80s.. before renewed, and increasingly severe downside into September. 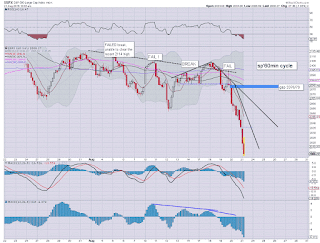 *closing hour.. further market horror... with wave after wave of selling... as no one wants to buy ahead of the weekend. 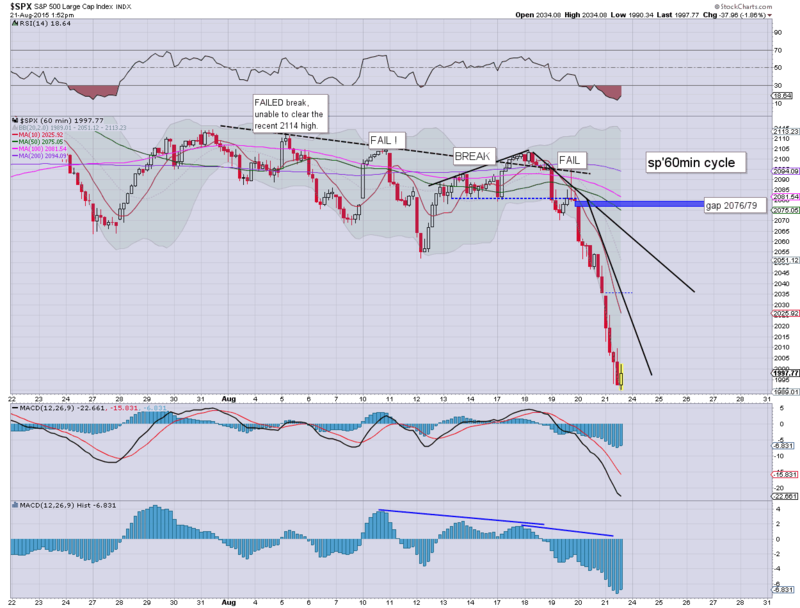 As Cashin on CNBC noted, how China trades overnight Sunday will be key. If the PBOC don't act... and the Shanghai comp' loses 3500s.... a Monday bloodbath will be due. ... and the wildest week since August 2011 comes to a close. Frankly, as of Wed' afternoon, around 2.30pm.. when we were trading at sp'2096, I was still hopeful of the sp'2050/40s - with VIX 18s, by the Friday close, but certainly.. to see the sp'500 lose the 2000 threshold - with VIX 24s, today was simply incredible to see. 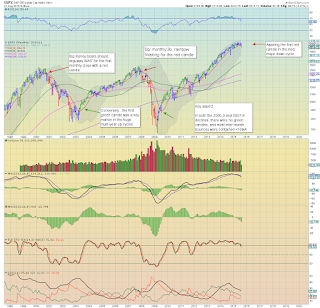 With huge technical breaks on the giant monthly cycles... the equity bears are now in control on the US market. All bounces are to be treated as such, and I will look to be all out short on any such bounce next week. Regardless of the exact close, it has been a wild week, with the most dynamic three day swing since 2011, from sp'2096 to 1986, with VIX exploding from 13.73 to 24.92. Most important of all though, are the critical technical breaks on the bigger weekly/monthly cycles, along with the underlying core trend from the March 2009 low. I'm tired.. and I'm starting to slow down. Along with many others, I think it is now a case of waiting for a bounce to play out next week, and then bears can confidently launch an all out short against the market. 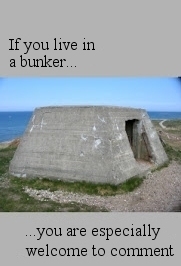 Oh wait.. I'm sounding like one of those 'malicious short sellers'. Is that a Chinese SWAT team at my door? 3.10pm.. sp -50pts @ 1985... VIX 25s.... wild day! 3.29pm... sp -55pts @ 1980.. VIX 26s...... the horror.... ! 3.36pm.. wave after wave of selling on my screen.... amazing to see... sp' -59pts @ 2076. US equities remain very significantly lower for the second consecutive day, with a new intra low of sp'2090 (last seen Feb' 2nd), with VIX climbing to 24.49. The smaller hourly cycles are still nowhere near offering a provisional turn, if that does occur next Monday... a bounce will likely last into Wed/Thursday. *seen on the bigger weekly cycle, today's VIX is the highest level since last December... and is clearly ahead of my original schedule. As for the market... with yet another marginal new low of sp'1990.. we still have ZERO clarification of a floor. 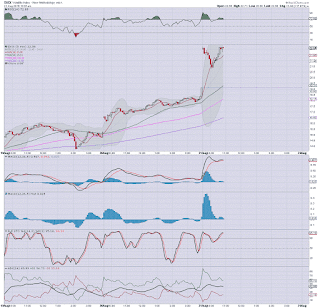 For the ultra cautious bulls, the next big buying level is around 16000, which is where the lower bollinger on the giant monthly cycle is. Incredible week... and I'm of the view this is just an initial break... not the main down move. US equities remain under severe downward pressure, but having collapsed from a Wed' afternoon high of 2096, this is a market that is unquestionably due a short term multi-day bounce. Clearly though, those trying to play such a bounce are currently still getting repeatedly whacked. It has been an incredibly wild time since Wednesday afternoon.. swinging from 2096 to 1993 in just 11 trading hours. Incredible. 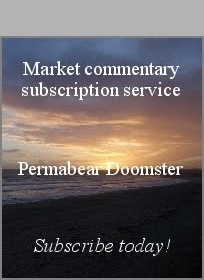 Regardless of the next multi-day bounce... the fact we've already seen a serious tremor across ALL world equity markets bodes well for the doomer bears this September. *there is a part of me that is highly tempted to attempt to pick up a short term long... but I am strongly resisting.... as it seems crazy risky. For now, I'm content to sit back.. and watch this play out into next week. There should be plenty of opportunity for the bears to re-short this market... September should prove to be highly entertaining.. and profitable. It is a truly bizarre fact that the sp'500 has fallen 103pts across just 11 trading hours - from the post FOMC minutes spike high of 2096... to a new intra low of 1993. 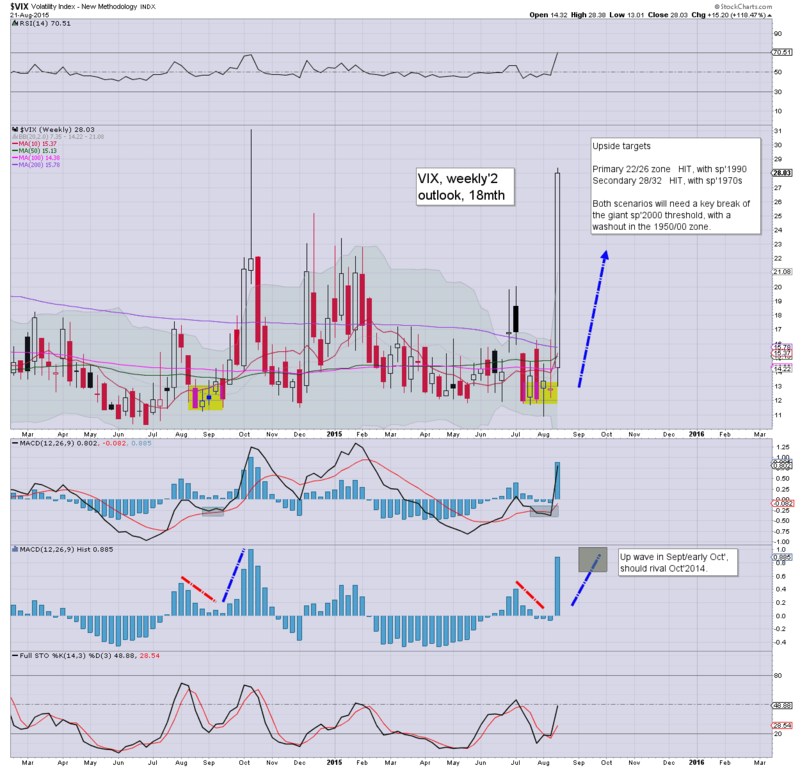 The VIX has similarly hyper ramped from 13.73 to 24.49. As things are... the dip buyers are getting relentlessly outright massacred. *clearly, the opening VIX candle was fully negated... and we're in territory not seen since last December.. when the sp' was flooring in the low 1970s. 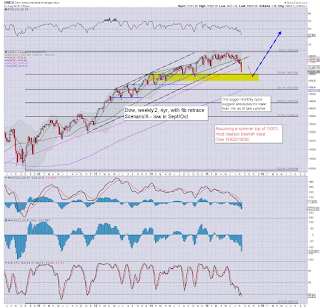 On one level I'm really surprised, but on another - via the bigger weekly/monthly cycles.. I'm not. I think it is a case that its been so long since we've seen consistant significant weakness... few can believe their eyes! 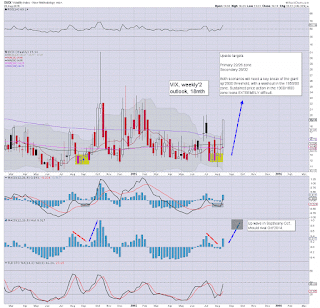 12.09pm... Short-stop cascade appears underway.. with market swinging from 1993 to 2007.. and rising... VIX cooling. 12.22pm.. chop chop... with a viable spike low of sp'1993... but clearly.. NO solid floor yet. 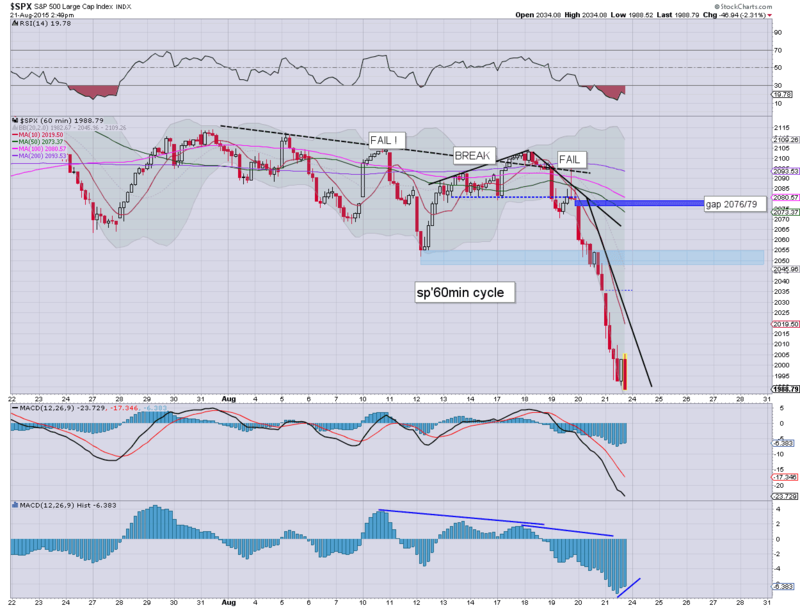 Indeed, at the current rate.. we could rally to 2120.. and we're still be -15pts on the day.. with no clear turn. 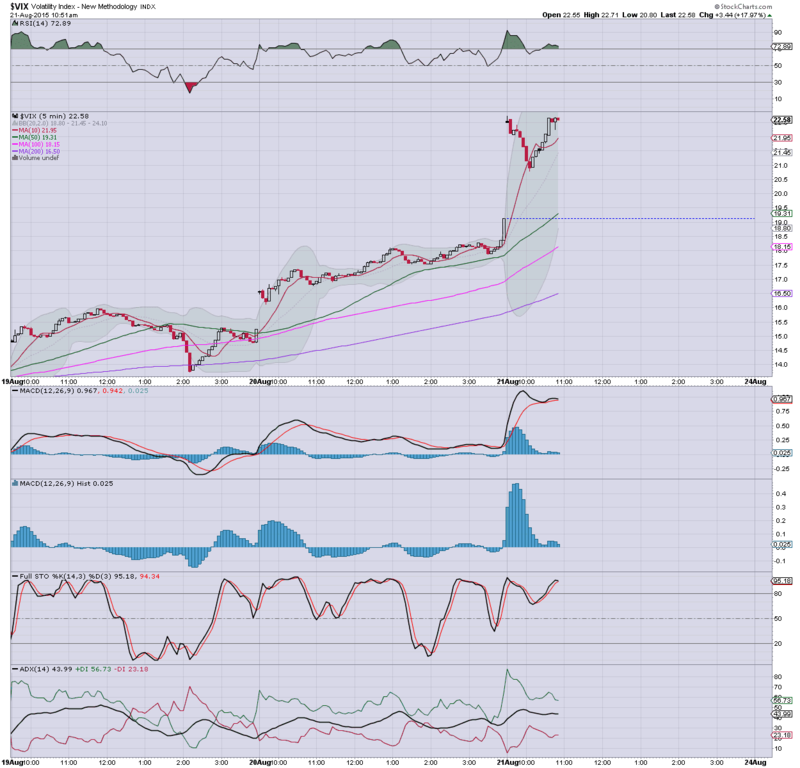 notable weakness, AAPL -4% in the $107s. approaching first target zone of 105/100. 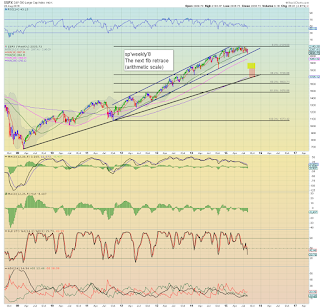 US equities see an early bounce.. but it was fully reversed, with a new cycle low of sp'2006. 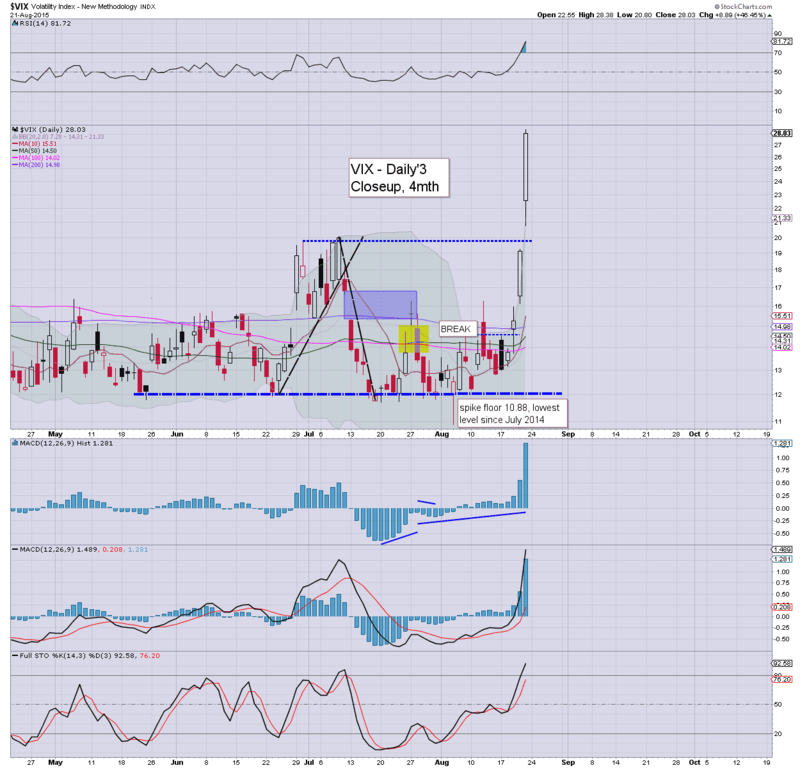 VIX has not yet confirmed the renewed weakness.. getting stuck with a fractionally lower high of 22.71. 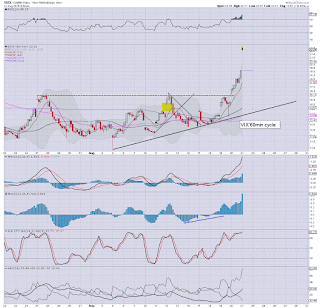 USD remains broadly weak, -0.8% in the DXY 95.20s. 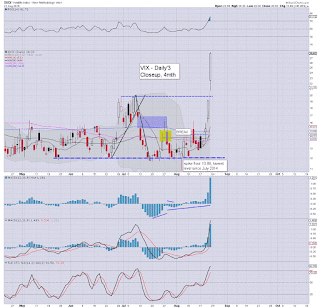 *note the opening black-fail candle on the VIX.. seen even on the nano scale 5min cycle. 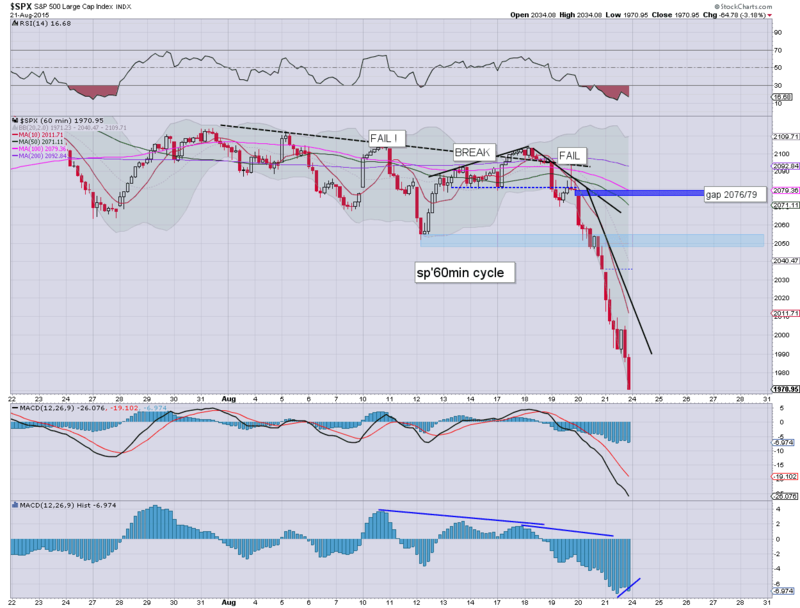 There is a viable micro double top.. with the bigger 15/60min cycles set to turn lower as the day progresses. 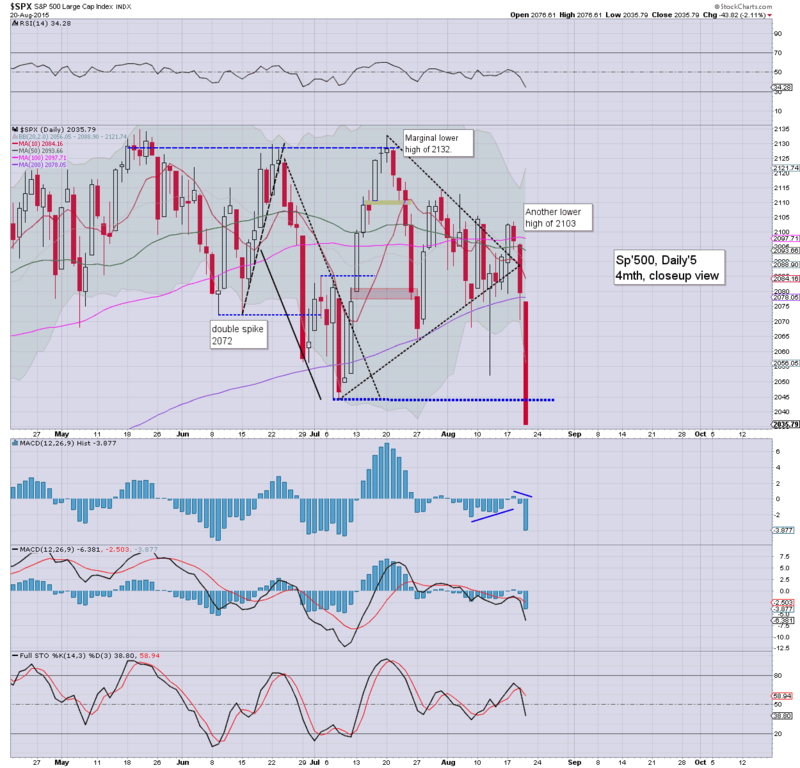 Clearly, a daily close in the sp'2040/50 zone looks very difficult right now.. but we're still set to get a bounce. To be clear though, I am NOT interested in trying to be clever and trade any such anticipated bounces. Overly risky.. in my view. Big picture 'doomer bears' should be more than content, as we've seen another huge set of bearish signals trigger today... and it should give confidence to those wishing to short the next bounce. Personally, the most amusing thing right now is seeing the mainstream get somewhat upset as we've fallen around 5% from the recent highs. 11.08am.. new lows.. sp'2002.. with VIX 23s.. pretty incredible. 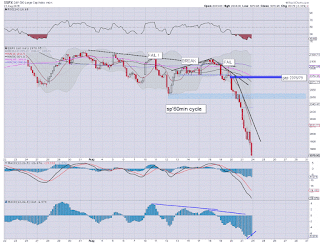 We're at typical turn time... there will be underlying natural pressure for a bounce from here to begin. Considering the sig' downside we've seen since Wed'... there will surely be a lot of bears wanting to close out for the weekend. 11.13am.. and there go the sp'2000 stops.... with VIX 24s. 11.26am.. TWO consecutive days where the broader market is net lower by around 2%.... when was the last time we saw that? Aug' 2011? US equities open significantly lower, but there are a number of reasons why some indexes will likely close net higher today... marking the start of a bounce to sp'2070/80s. 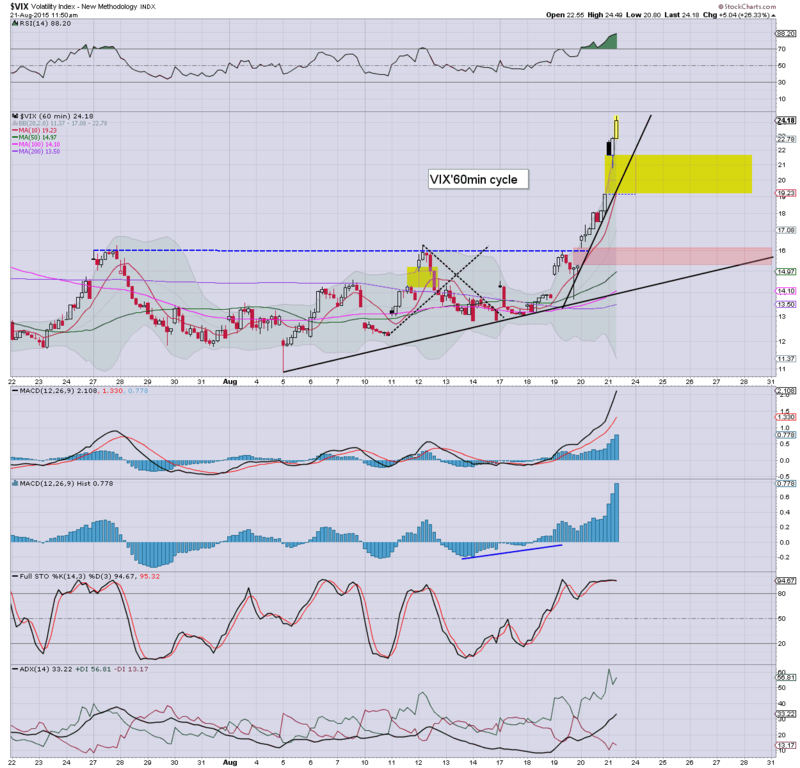 VIX has put in an early high of 22.71.. a close in the 18/17s is very viable if sp'2040/50. *I could highlight a thousand charts this hour... all the momo stocks.. indexes... the giant monthly cycles... its hard to choose! 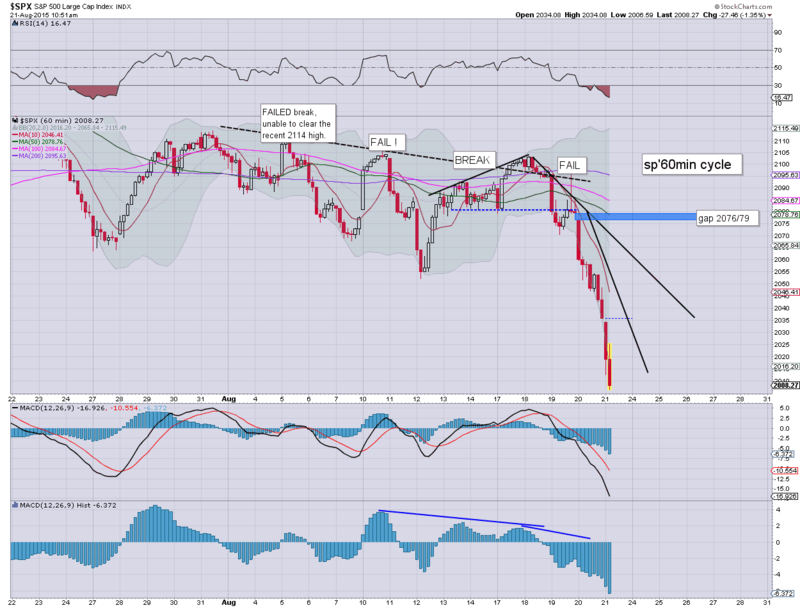 So.. we opened lower.. but I am still guessing we'll see the sp'500 close net higher. I guess you could call that a crazy bold call, but there are various reasons why we won't break any lower from here. 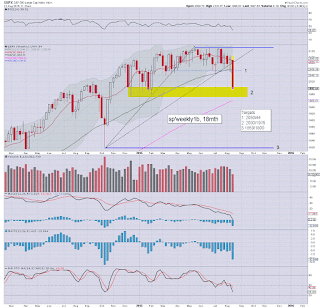 A red candle on the sp' monthly 'rainbow'... having followed the Trans, and Dow. You don't get a more bearish signal than that. 10.09am... the VIX did indeed get a black-fail candle.. and it certainly bodes in favour of the bulls into the weekly close. 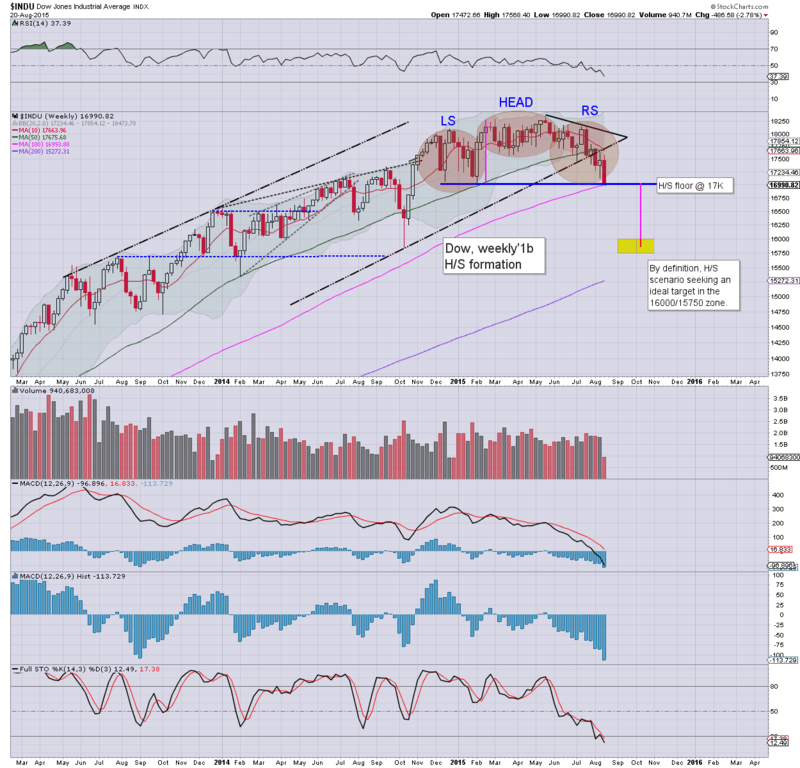 Since it is opex... it'll be choppy.. but we do look set to have the indexes turn positive. 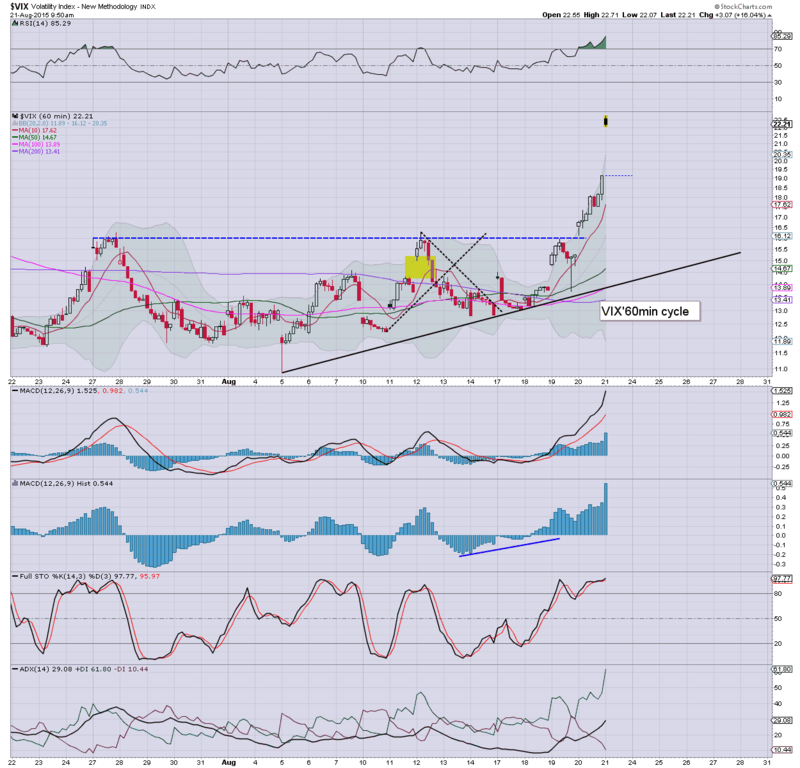 INTC appears to be leading the way back up... having already briefly turned green. Good morning. Equity futures remain weak, sp -12pts, we're set to open at 2023. USD is notably lower, -0.5% in the DXY 95.40s. Metals and Oil are broadly flat. China continues to unravel, with the Shanghai comp' settling with a net weekly decline of -11.9%. *futures saw a low (as far as I am aware) -17pts... to an equiv' cash level of sp'2018 or so. Re: weekly'8. 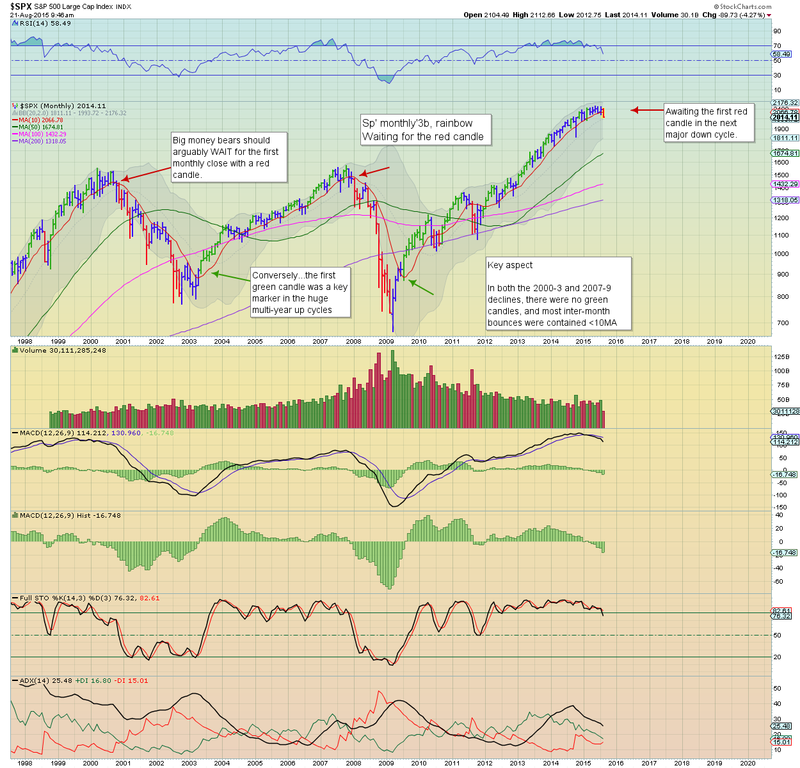 Despite recent price action, I find the notion of the sp'1800s, never mind anything lower difficult to envision. 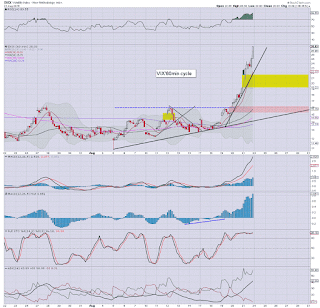 On a arithmetic scale... first rising support is around 2025/2000... after that.. core support is 1725/00 by Oct'.... and that would be a clear 100pts below the lower monthly bollinger. I find such a decline unlikely, as it would be highly suggestive that a key multi-year peak has occurred at sp'2134. In any case, we should have some clarity in October. We have a very dynamic opex Friday ahead. Best guess... a net daily gain, a weekly close around sp'2050 would be very natural, despite a weak open. It won't take much across next Mon/Tuesday to drive the market to 2075/80... fill the gap, burn off the oversold condition... and then next wave to sp'2000/1975 - with VIX 20s... by end month. Overnight China action: Ended the week on a down note, settling -4.3% @ 3507. The key low of 3373 looks set to be taken out... and then its the 3200/3000 zone. 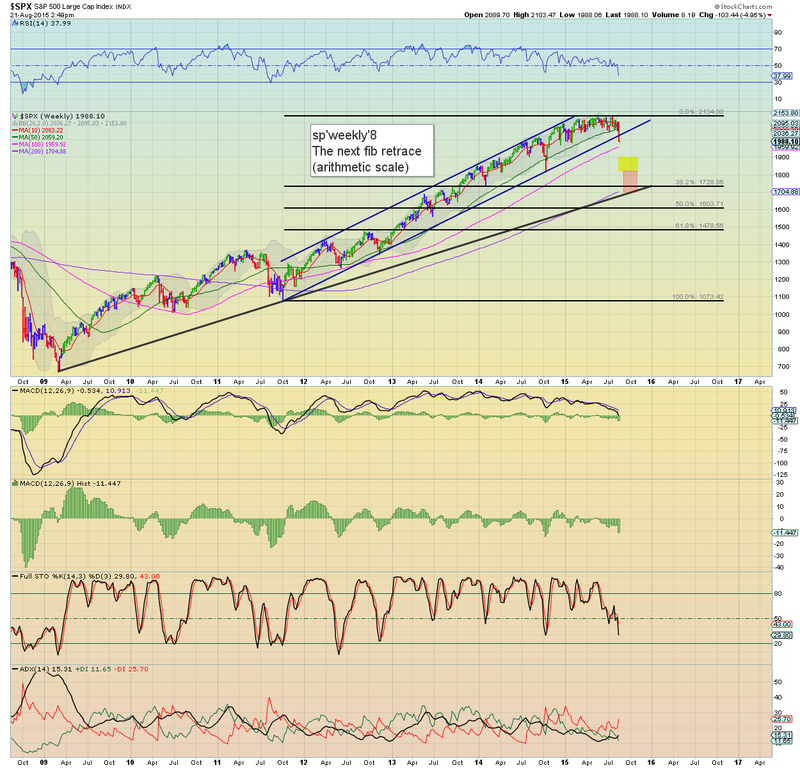 If world markets really get upset in Sept/Oct... a washout to around 2500 is possible. What will be particularly interesting to see is how the Chinese leadership react. I'd imagine a break <3K will result in dawn raids at various residences where 'malicious short sellers' live. What am I doing today? I don't particularly want to risk trading the long side for a bounce. I guess if I 'had to' trade something for a day trade, I would be long AAPL. 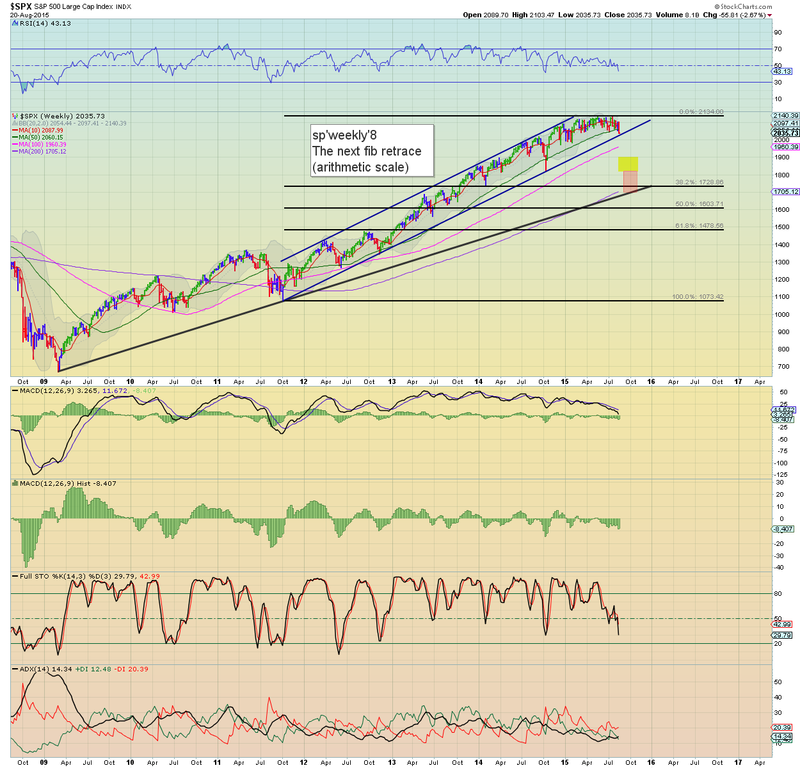 As things are, I'm content to sit it out, and look for a major re-short from sp'2075/80 next week. 8.23am.. futures cooling... sp -16pts... that will make for 2019... a mere 1% from the giant psy' level of 2000. 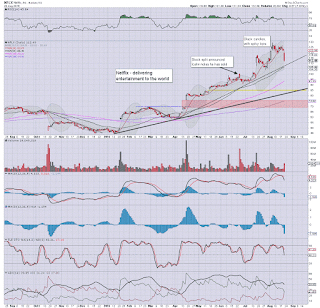 NFLX -6%... in the $106s. 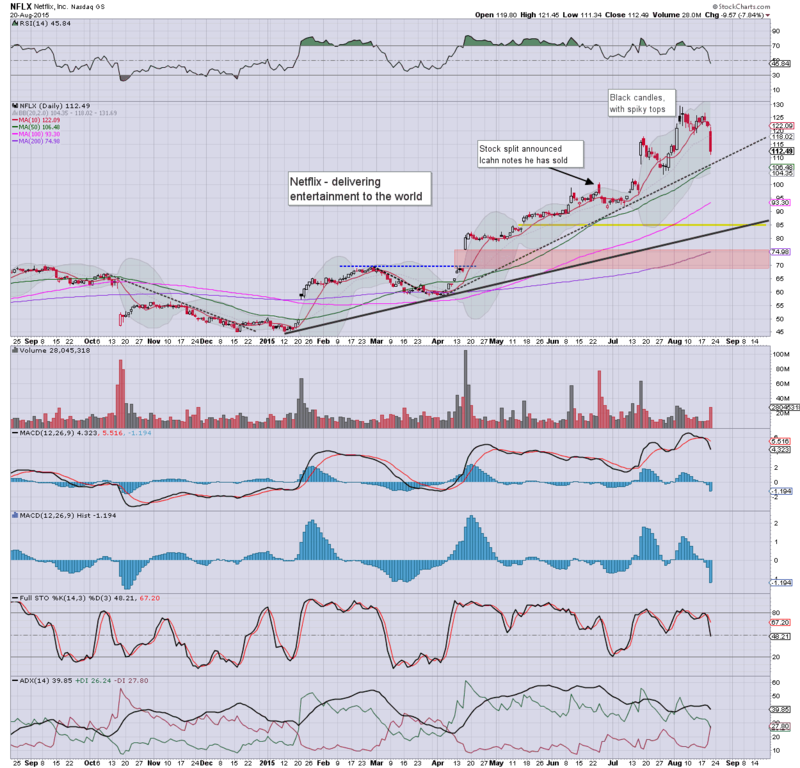 FB -2.4%, TWTR -1.1% in the $25s (new historic low), the momo stocks are getting hit rather hard. 9.04am.. Lol @ CNBC... with the Cramer making an unscheduled appearence because of this 'severe down turn'... when really, we're barely 100pts... not even 5% below the historic high. Can you imagine how these clowns will react when we're another 5-10% lower? 9.36am.. Eyes sharp for a black-fail candle on the VIX... which opened in the 22.50s. 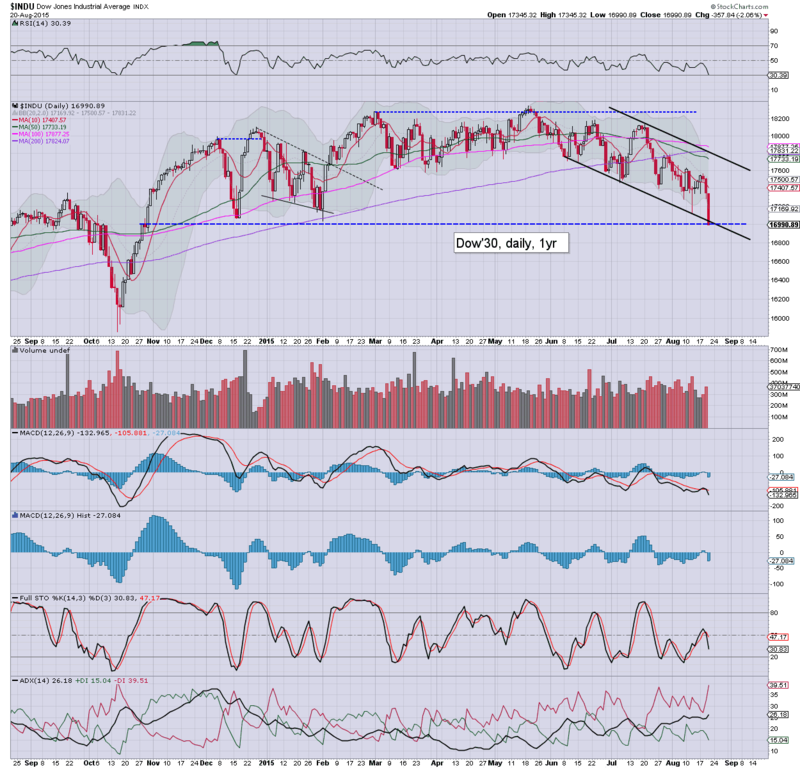 Unquestionably, a rough day in the US equity market, with the sp'500 settling at 2035, with Dow 16990 and VIX 19.14. The smaller hourly cycles are offering upside into next week.. with an initial target of sp'2075/80 zone. 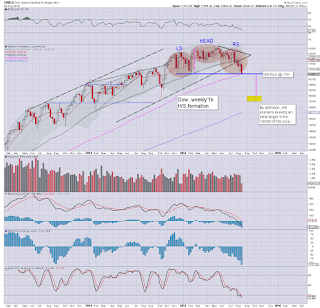 Sustained action >2100 looks out of range for some months. Last evening I concluded 'The US market is in trouble'. My short term targets have all been met - earlier than expected, and now I have to assume we'll see some kind of bounce into next week. VIX is panning out as expected, and even if it cools to the 15/14s next week, we could easily hit the 20s by end month. For me, the real issue is whether we only get to the mid/upper 20s... or the more exciting 30s. Friday is opex, so expect some serious chop (with an upward bias).. especially in the late afternoon. I have very little tolerance for letting opening net gains turn into afternoon net losses, and so I placed some tight stops on a VIX-long and AAPL-short position. Naturally, I was kicked within minutes, and that was my day ended.. as I sure wasn't interested in chasing the market lower. No doubt we'll see some strong bounces (we've not already forgotten about the post FOMC minutes Wednesday hyper-ramp to 2096 have we?).. 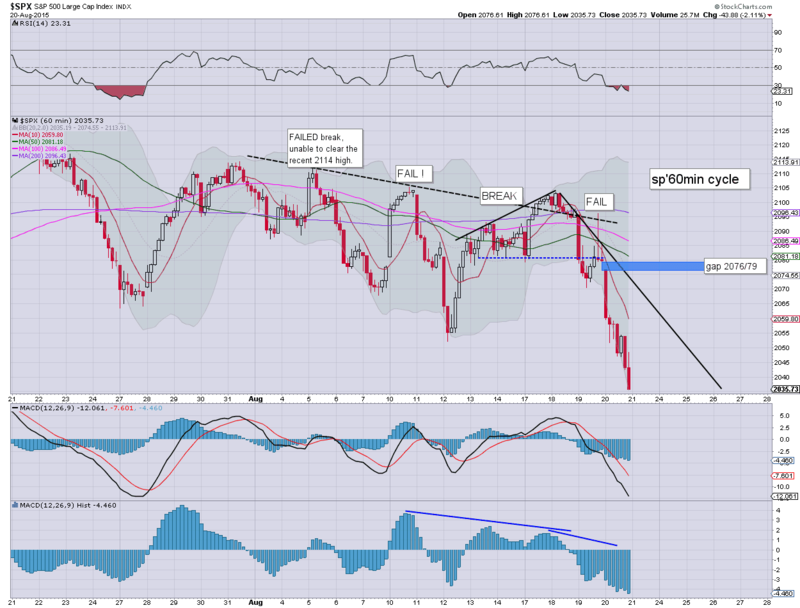 but broadly, this market looks set for much lower levels across the next few weeks. I can only hope I will have more patience with my next set of trades. 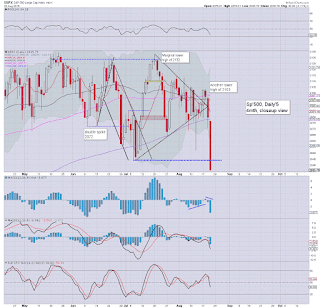 US equities closed significantly lower, sp -43pts @ 2035. The two leaders - Trans/R2K, both settled lower by -2.5%. 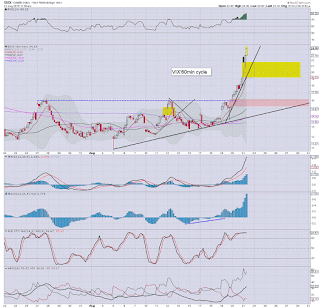 Near term outlook offers a short term floor, with a probable bounce to the 2075/80 by next Tuesday... which should equate to VIX cooling to the 15/14s. 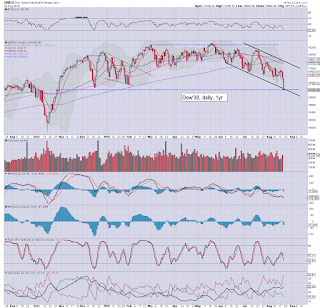 The daily close under the 200dma of sp'2078 was very bearish, but perhaps.. the close under Dow 17k was extremely bearish. 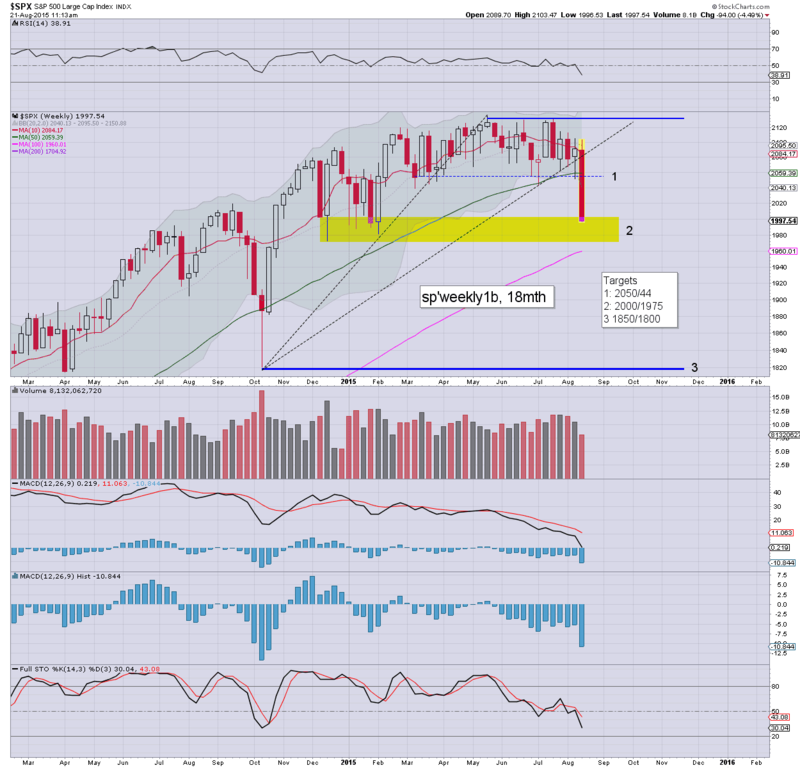 Regardless of any bounce into early next week, much lower levels look due into end month, and across September.